A crew of thieves has just stolen millions from a drug cartel's safety deposit box. Their paranoia starts to get the best of them when it appears someone has leaked their plans and their escape route is blocked. Accusations start to fly as they believe there must be a rat in their midst. "Dead Draw" is written and directed by Brian Klemesrud. This film was a selection at the San Diego International Film Festival, but unfortunately, it did not fit into our schedule when we attended. It stars Gil Bellows, Michael Eklund, Andy Ahrens, and Faust Checho as a crew of bank robbers. The crew's latest job involves stealing millions of dollars from safety deposit boxes owned by a drug cartel. The job itself goes smoothly as they are in and out quickly without a trace. Upon arriving at an airport hanger where they plan to catch a small plane out of the country, they find their pilot dead. The circle of people who knew about the job is very small, so they figure there must be a rat amongst them. As their paranoia takes over, the crew begins to fall apart. Boy, we wish we had gotten to see this film on the big screen! It is a tense crime thriller mystery with a lot of "whodunit" thrown in for good measure. The film seems to be strongly inspired by the works of Quentin Tarantino, or at least by the same films that inspired Tarantino himself, which is not a bad thing in the slightest. This movie, in particular, has a very "Reservoir Dogs"-esque feel, and there are even some thematic elements reminiscent of "Pulp Fiction." Ultimately, Klemesrud does do his own twist on the paranoia-drenched heist gone wrong, one we think is both new and old at the same time. This is a fairly low budget film with a small cast, but it is mostly well acted with a very compelling story. It kept us thoroughly engaged throughout its run time, especially as we unfurl the mystery of who the rat is as each character is developed through a series of flashbacks and eliminated one by one. 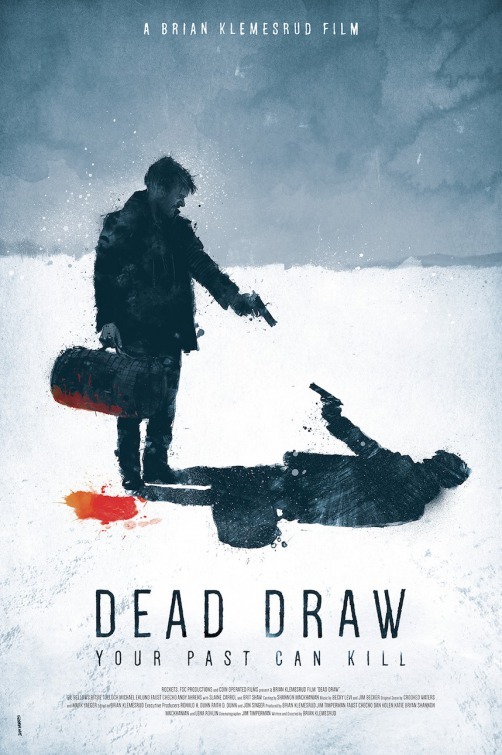 "Dead Draw" may not be crafted by a well-known director, but it is absolutely worth watching. As friends turn into enemies and every person remains a suspect, this movie quickly unfurls with intrigue, great acting, and plenty of bullets. *We were lucky enough to be given the chance to review this excellent film, and we want to give special thanks to the crew of "Dead Draw" for allowing us the opportunity to screen the movie. If we hadn't gotten sick, the review would have been out much earlier, and for that, we sincerely apologize.